MS Fram anchored in Magdalenafjord, Norway. Courtesy Hurtigruten. For years, the Arctic haunted me. I longed to cruise those northerly waters, to set foot in that stark, mysterious land. I dreamt of tracking rare wildlife, from walruses and whales to reindeer and polar bears, and of following the flights of black-legged kittiwakes, northern fulmars and glaucous gulls across ice-blue Arctic skies. Most of all, I yearned to follow in the footsteps of legendary Norwegian explorers like Fridtjof Nansen and Roald Amundsen. Mounting a full-scale expedition was impossible, so I decided the best—and most enjoyable—way to experience the Arctic would be aboard the Hurtigruten cruise line. Founded in Norway in 1893 to transport commuters and goods between 34 ports, Hurtigruten is a Norwegian institution, best known for its Classic Coastal Cruises. 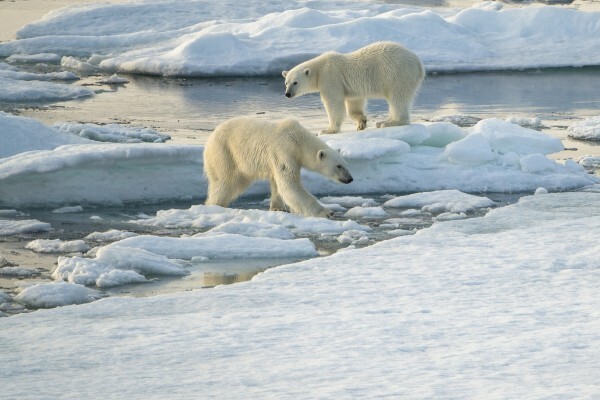 The line also offers more than two dozen Arctic Explorer Voyages to the isle of Spitsbergen, in Norway’s remote Svalbard archipelago, as well as combination cruises to Spitsbergen, Iceland and Greenland. I booked “Polar Bears, Islets and Fjords,” a 13-day adventure exploring both the Arctic and the Norwegian coast aboard the MS Fram, named for the ship that Amundsen and Nansen sailed on their polar expeditions. For five days, I’d cruise the west coast of Spitsbergen, 600 miles south of the North Pole and 600 miles north of the Norwegian mainland. Then, for another eight days, I’d cruise Norway’s fjord-indented coast. In the days of 19th-century explorers, the Arctic was largely terra incognita. Polar fleece and Gore-Tex had not been invented, and global warming had yet to become a buzzword. These days, cruise ships make regular stops in the Arctic, and there are several major settlements with permanent residents as well as research stations. At the Arctic Ocean’s southern fringe, at 78 degrees north latitude, Spitsbergen is surprisingly warm, owing to the jet stream. But the Arctic’s high winds and rapid climate changes demand respect. Hornsund, Spitsbergen’s southernmost fjord. Photo courtesy Hurtigruten. Before setting sail in late September, Hurtigruten sent me detailed pre-trip instructions. 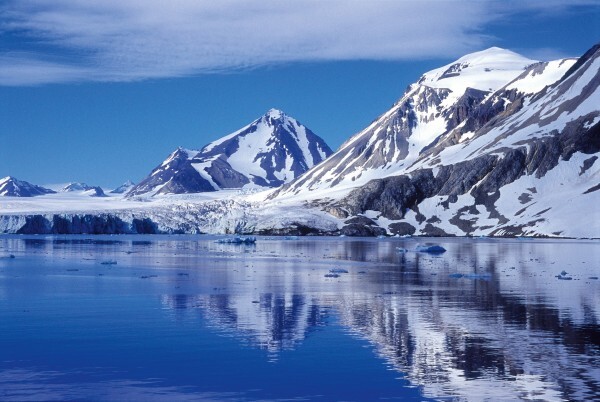 In Spitsbergen, fall temperatures average 30 degrees, but can suddenly drop, or climb as high as 60 degrees. Underneath my L.L. Bean 3-in-1 parka, with its zip-in polar fleece jacket and removable hood, I’d need layers to stay comfy on cold and warm days. Along with cotton turtlenecks, long-sleeved tees and polo shirts, and several pairs of jeans, I packed plenty of wool—a red union suit, a heavy sweater, thick socks and a watch cap—as well as lightweight synthetic long underwear and waterproof gloves. For shore landings, I carried rubber pants by Helly Hansen, supplier to generations of Norwegian fishermen and explorers. I also packed stylish Helly Hansen hiking boots in waterproof black leather with thick treads. Finally, I took along a pair of Julbo glacier glasses with leather side shields to thwart intense Arctic rays. Arriving in Oslo aboard Icelandair, I checked into the Clarion Hotel Royal Christiania and spent three days soaking up culture in Norway’s fjordside capital. Then I hopped a three-hour Norwegian Air shuttle flight northwest to Spitsbergen, largest of the Svalbard islands. In Longyearbyen, Spitsbergen’s main city, I joined other Hurtigruten cruisers for an overnight at the four-star Radisson Blu Polar Hotel, with 95 contemporary-style rooms, free Internet access, a sauna and several outdoor Jacuzzis, and two dining rooms—Restaurant Nansen for elegant New Nordic Cuisine featuring whale, reindeer and Arctic char, and Barentz Pub & Spiseri for pizza, burgers and steak. Surrounded by mountains, Longyearbyen’s treeless permafrost is punctuated by low-slung buildings with corrugated tin roofs. In the 17th and 18th centuries, whaling, and walrus and seal-hunting put Spitsbergen on the map. In the 1890s, coal-mining drew speculators from Norway, Russia and elsewhere. Michigan industrialist John Munro Longyear and Lowell, Massachusetts mill owner Frederick Ayer founded the Boston-based Arctic Coal Company, operating, from 1906 to 1916, on Spitsbergen’s west side, near the Adventfjord. They christened their company town Longyear City, or Longyearbyen in Norwegian. 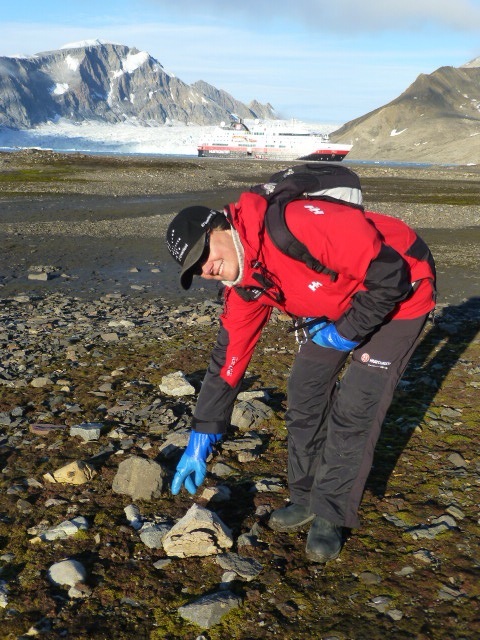 Today, on one of Hurtigruten’s pre-cruise excursions, “Fossil Hunt With Pack Dog,” you can take a short hike with local outfitter Green Dog Svalbard and see Longyear’s abandoned mineshafts jutting from the scree-covered hills above town. With only a few main streets, Longyearbyen is easy to get around. Beside the University Centre, the contemporary-style Svalbard Museum has award-winning exhibits on the archipelago’s history, geology and wildlife. A huge stuffed polar bear, one of scores in Longyearbyen, dominates a striking display of Arctic birds and mammals. Uphill, a pedestrian mall has several blocks of bars, restaurants, gift shops, outfitters, small hotels and a Coop supermarket. Stylish café Fruene, the world’s northernmost chocolatier, is renowned for its little white-chocolate polar bears with dark-chocolate eyes. At trendy Huset, in a big white Art-Deco mansion, reserve ahead to dine on New Nordic Cuisine in the formal restaurant, or drop into the bistro, as I did, for homey dishes like reindeer stew with mashed potatoes, pickled lingonberries and sweet gherkins, and craft beer from Longyearbyen’s Svalbard Bryggeri, world’s northernmost brewery, opened in 2015. 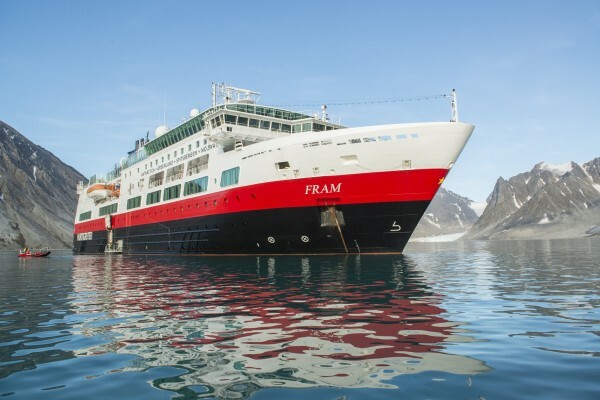 After 24 hours in Longyearbyen, I found the MS Fram, in gleaming red, black and white livery, waiting for me the next afternoon at the harbor. Once all 318 passengers were aboard, we headed to the spacious, multilevel Imaq restaurant with wraparound windows for a buffet lunch of creamy vegetable soup, salads and hors d’oeuvres, baked cod and other hot entrees, and ice cream, cakes and puddings. Steaming northward along Spitsbergen’s coast, it wasn’t long before we sighted a large pod of big, lazy walruses sunning themselves on a sandbar. As the ship drifted past ice-covered mountains and long-tongued glaciers, I explored the ship. In the spacious Qilak Observation Lounge, with floor-to-ceiling windows that looped around the bow, some passengers were already ensconced in comfy armchairs. In the afternoon, we’d gather here for tea and pastries, sometimes crepe-like Norwegian pancakes with lingonberry jam. In the evening, we’d relax over cocktails, wine or stiff shots of Norwegian aquavit. In several small salons, the Expedition Team, which led our shore adventures, lectured and showed films on Arctic ecology and wildlife. Also aboard ship: a bistro, fitness room, two saunas, two deck-side hot tubs, and a boutique selling everything from cloudberry jam to Helly Hansen jackets. The 128 cabins included spacious, well-appointed suites, some with balconies, and cozy standard cabins like mine with two bunks that converted into couches, a desk, a closet, and a bath with shower. On our second morning at sea, we crossed the 80th parallel north, a major Arctic milestone, and the excitement aboard ship was palpable. 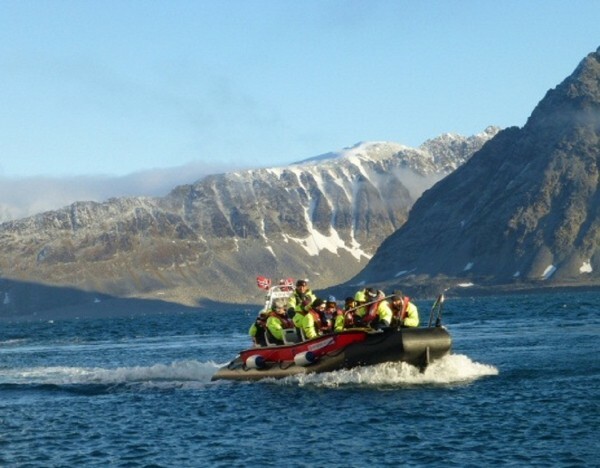 Outfitted in sturdy rubber muck boots, bulky dry suits and waterproof aquamarine jackets with red-and-white Hurtigruten logos, several groups boarded Zodiac-like Polarcirkel boats. En route to the Magdalenefjord from Virgohamna—the same bay Swedish explorer S.A. Andrée left to begin his ill-fated 1897 balloon expedition to the North Pole—they would sight pods of white beluga whales and herds of short-legged Svalbard reindeer. The rest of us continued south aboard the Fram. Crunching through a field of ice chunks, big and small, our ship soon neared the Fram Glacier, where Fridtjof Nansen’s original Fram landed in 1896 after attempting to drift across the North Pole. On the Magdalenefjord’s south shore, we anchored in Trinity Bay, where glaciers creep to the sea between sawtooth mountains. Polarcirkel boats sped us to the historic Gravneset headland, site of a large sandy burial mound with 130 unmarked graves of English and Dutch whalers from the early 1600s to the late 1700s. Strewn across the beach were rusty remnants of metal ovens once used to melt whale blubber for oil. It didn’t take much imagination to conjure up images of those long-ago whalers, far from home, succumbing to the elements before being buried in this stark landscape where, from time to time, high winds exposed their bones to an intense Arctic sun. But little dampened our spirits at finding ourselves in such a stunning setting. Some passengers were so excited that they took polar-bear plunges into the frigid waters. Aboard ship, we later celebrated our first landfall with a fine dinner of scallop carpaccio, salmon with puréed potatoes and peas, and multekrem, golden cloudberries in fresh cream. The next morning found us in Hornsund, Spitsbergen’s southernmost fjord. We anchored in Austre Burgerbukta bay, surrounded by the 4,695-foot-high Hornsundtind and other mist-encircled peaks that shelter the Little Auk, a chubby black-and-white seabird. Visiting Austre Burgerbukta in spring, we might have seen a mother polar bear emerging from her den with newborn cubs. In summer, the big white bears might have been hunting seals among the ice floes. But in fall, when polar bear sightings are rare, we were thrilled just to see their huge paw prints in the sand. We anchored, the following morning, near Svalbard’s southernmost isle, tiny Bjørnøya, where sheer cliffs plunge directly into the sea. Cruising around the island in our Polarcirkel boats, as scores of glaucous gulls, northern fulmars and black-legged kittiwakes wheeled overhead, I photographed the tall dolomite pillars known as Sylen and Stappen, and a shipwrecked Russian freighter from the ’80s. Back aboard ship, our burly cook proudly paraded through the dining room with lunch—a huge codfish he had caught around Bjørnøya. That night, after a superb dinner of reindeer fillet and Arctic char, I stood on the upper deck, gazing in wonder at the deep-orange “Blood Moon” of a total lunar eclipse. The next day, the Fram began its cruise down Norway’s coast. Weaving through fjords, backed by glaciers and snow-covered mountains, we stopped at tiny waterside villages like Nyksund, with small cafés, guesthouses and art galleries, on Langøya Island in the Vesterålen archipelago. In the idyllic Lofoten Islands, we cruised through the narrow, granite-walled Trollfjord, home of broad-winged sea eagles. In Tromsø, “Gateway to the Arctic,” we hiked up 1,916-foot-high Mt. Fløya, saw modernist works at the Nord Norsk Kunst Museum, and toured The Polar Museum with its rich cache of sleds, fur parkas and other gear from the expeditions of Nansen and Amundsen. In Svolvær, at the Lofoten War Museum, we pored over intriguing Allied and Nazi memorabilia. Finally, the Fram anchored in Bergen. Before heading home, there would be time to visit colorful Hanseatic warehouses along the docks, to sample the city’s famous fish chowder, to tour Troldhaugen, composer Edvard Grieg’s country estate, and to ride the funicular up Mt. Fløyen for a bird’s-eye view of seven surrounding mountains. Back in the Boston area, I would spend days recalling all the sights and scenes of my Hurtigruten adventure. It had taken me more than half a lifetime to reach the Arctic. But some things, I realized, are truly worth waiting for. 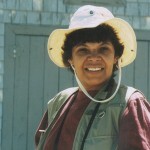 To book Hurtigruten Explorer Voyages and other cruises, call (866) 552-0371 or visit www.hurtigruten.com. For well-priced fights, contact Icelandair (www.icelandair.us) and Norwegian Air (www.norwegian.com). For more on Norway, log on to www.visitnorway.com. Hornsund, Spitsbergen's southernmost fjord. 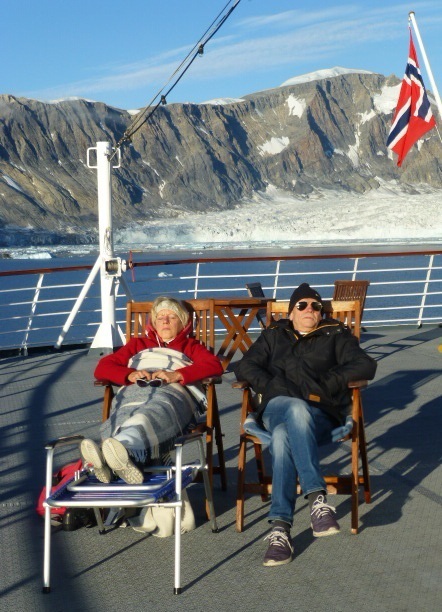 Photo courtesy Hurtigruten.